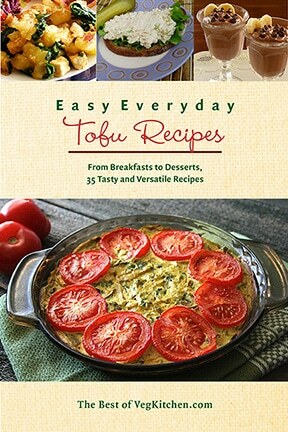 Easy Everyday Tofu Recipes (pdf e-book) features 35 of VegKitchen’s easy, tasty recipes for using firm, extra-firm, baked, and silken tofu. You’ll find simple ways to prepare tofu, main dishes, soups, stews, salads, spreads, dips, and even a handful of desserts. If you’re a tofu fan you’ll love having a focused array of recipes right at hand. Sample Lemon-Pepper Tofu Cutlets, Crustless Tofu-Broccoli Quiche, Southwestern Tofu Scramble, Creamy Corn Chowder, Silken Tofu and Sun-Dried Tomato Dip, Berry-Topped Vegan Cheesecake, and lots more! Photos of 6 recipes are included. See entire recipe listings under the cart buttons. 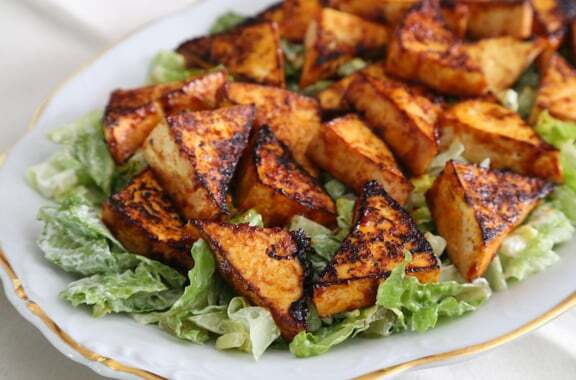 Easy Everyday Tofu Recipes is part of VegKitchen’s “Best of VegKitchen” pdf e-book series. Featuring 35 or so recipes that have proven most popular on the site, these compact e-books let you to delve into specific food niches without poring through lots of web sites (or even just VegKitchen, which in itself has thousands of recipes!). Please note — these e-books can be viewed on your computer after downloading, or printed and popped into a binder, but they are not formatted for e-readers such as Kindle, Nook, etc.